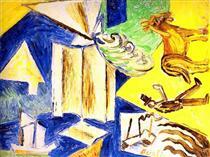 David Davidovich Burliuk (Ukrainian: Дави́д Дави́дович Бурлю́к; 21 July 1882 – 15 January 1967) was a Ukrainian Futurist, Neo-Primitivist, book illustrator, publicist, and author associated with Russian Futurism. Burliuk is often described as "the father of Russian Futurism." 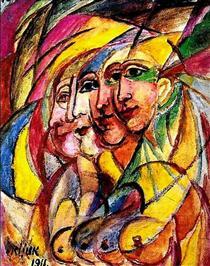 David Burliuk was born in 1882 in Semyrotivka near the village of Riabushky (now Lebedyn District, Sumy Oblast) in the Kharkov Governorate of the Russian Empire (present-day Ukraine), brother of fellow artist Volodymyr Burliuk in a family partly descended from Ukrainian Cossacks who held premier positions in the Hetmanate. His mother, Ludmyla Mikhnevich, was of ethnic Belarusian descent. 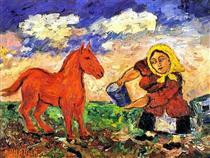 Because of his given name of "David," Burliuk was frequently mistaken for being Jewish. In 1908 an exhibition with the group Zveno (")The Link") in Kiev was organized by David Burliuk together with Wladimir Baranoff-Rossine, Alexander Bogomazov, his brother Volodymyr (Wladimir) Burliuk and Aleksandra Ekster. In 1909 Burliuk painted a portrait of his future wife, Marussia, on a background of flowers and rocks on the Crimean coast. Many times thereafter he would set the image of his wife to canvas. Without question two dreams possessed his heart all his life: the face of his wife and the portrait of his homeland - first Ukraine and then his adopted country, the United States. 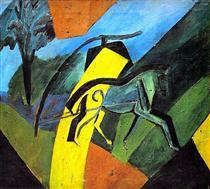 From 1910 he was the member of the group Jack of Diamonds, and from 1910 to 1911 he attended the Art School in Odessa. After 1911 David concentrated on poetry. 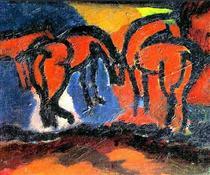 From 1911 to 1913 he studied at the Moscow School of Painting, Sculpture and Architecture (MUZHVZ), and that year participated in the group exhibition of the Blaue Reiter in Munich, which also included his brother Wladimir. 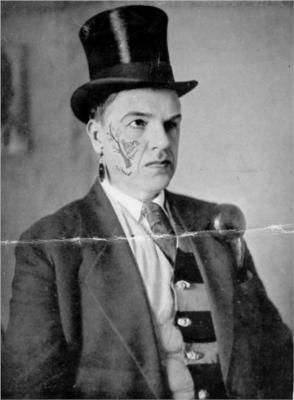 In December 1912 David Burliuk was co-author of the manifesto A Slap in the Face of Public Taste with the other members of Hylaea, said to be the start of Russian Futurism, a movement of Russian poets and artists who adopted the principles of Filippo Marinetti's "Futurist Manifesto". In 1913 he was expelled from the Academy. In the same year D. Burliuk founded the publishing venture of the futuristic writer's group Hylaea. In 1915 David Burliuk published the book The Support of the Muses in Spring, with illustrations by Lentulov, and by David and Wladimir Burliuk. From 1915 to 1917 he resided in the Urals with frequent trips to Moscow and Petrograd (St. Petersburg). 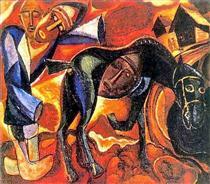 In 1917 he participated in an exhibition with the group Jack of Diamonds in the artists' salon in Moscow, which included Aleksandra Ekster and Kazimir Malevich. In 1916 his brother Wladimir Burliuk was drafted into military service, and in 1917 was killed in World War I in Saloniki. The next year Burliuk began traveling to the United States, a process that took him through Siberia, Japan, and Canada and wasn't complete until 1922.